This has been a difficult site to pin-point with any precision...so this choice of location is an "educated-guess", but I think it's pretty accurate. Dockray (Dockwray) Hall was the site of a fortified tower with an attached chapel dedicated to St Anne. The tower and the chapel appear on most old maps, up until around 1938...the most recent map I could find with any mention of the buildings. Even then, the tower and the chapel were no more, and the site is labelled as "Dockray Hall Barn , on the site of Dockray Hall". It would appear that elements of either the chapel or the tower, or both structures were incorporated into a barn (a house in some records) that was still extant in the 19th century. The chapel was still standing in the 16th century when Machel was travelling the area cataloguing the fortifications of the region. It would appear that the tower and the chapel had an encircling wall. Whether this would have constituted a curtain wall or a simpler barmkyn, is not known....but on John Speed's map of Kendal, dated 1610, Dockray Hall can be seen at the top left hand corner within a square compound, possibly a wall. Above. 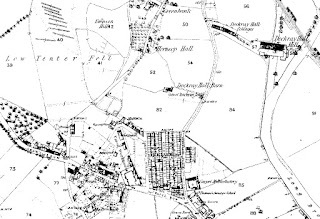 Detail from John Speed's map of Kendal, showing the Dockray Hall compound. This appears to be the only representation of the compound that we have. No contemporary paintings, sketches etc exist of the chapel and the hall. Above. Modern map (1930s?) showing location of Dockwray Hall Barn. Above. Sparrow Mire Lane from Burneside Road. The site, shown above, is at the modern day junction of Burneside Road and Elm Court. This area is raised above land to the East, and lays about 400 yards to the West of the River Kent. Originally, as shown on maps up to 1938, the area was open fields. A map dated 1898, shows hardly any buildings to the North with the buildings of Union and Cross Street the nearest structures to the South. These days, there are houses to the North, South, East and West....with just a small section of wooded area showing where the tower and chapel may once have stood. There is a connection between Dockray Hall in Kendal, and Borwick Hall near Lancaster....both fortified residences, and both the homes of wealthy local land owners. Borwick Hall was the home of Sir Robert Bindloss (died 1629). Sir Robert married Alice, daughter of one Lancelot Dockray, owner of Dockray Hall. There is also mention in local historical documentation, of the Phillipson family, who also held Hesfell Hall in Kendal, and Hollin Hall near Crook. The family were staunchly Royalist, and it's therefore likely that, at the same time they lost Helsfell Hall to the Parliamentarian authorities, Dockray Hall was forfeited by them. It's likely that what was saleable was sold off, and the remains demolished, except the chapel which was then converted to a house. There are now no remains of any of the buildings, including the barn. These earthworks, hidden from view from the nearby A66, were overgrown and difficult to make out with their covering of gorse bushes and the surrounding high hedges. The remains can be found in a field just off the A66, about two miles South of Appleby, on the banks of Hilton Beck where it converges with George Gill to form Coupland Beck. From aerial photos, the earthworks appear to be square shaped, although inspection from the ground shows them to be nearly circular in shape, about four feet high, with a slightly dished interior, dipping to around one foot below the rim. Various internet sources mention a cross wall, or masonry...although when I visited, only a few stones were visible on the Northern edges of the earthworks. If, as some sources say, this site represents the remains of a ring-work....it would have been a very small ring work indeed. I think these references are in fact related to another earthwork about a quarter of mile to the East. The earthworks are perhaps only 40 feet by 40 feet, the interior of which is tiny...and would only have been able to house a small building or a small number of people. As a defensive site, it is overlooked from the North by higher ground, but has clear line of sight over the beck to the East, and lower ground to the West and the South. Indeed, the West side of the earthworks drop away very steeply to the road some seven or eight feet below. 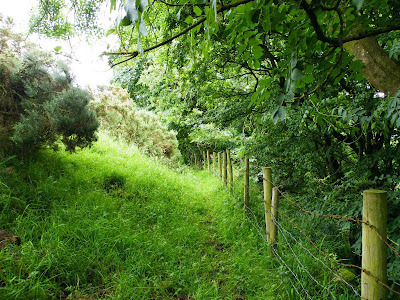 The above photos shows the fence that separates the earthworks from the steep drop to the road beyond. There don't appear to be any infilled ditches around the site, and no further banks or earthen ramparts anywhere else on the site. There are high banks running along side the banks of Hilton Beck to the East...perhaps indicating an attempt to shore up the banks from erosion, perhaps the remains of an attempt to prevent any incursion across the very shallow beck. One interesting fact about this field though, is that the ordnance survey map shows the course of the old Roman road running North South through this field. If the route marked on the map is to be trusted, the old Roman road would have run just a few feet from the Eastern exterior of these earthworks....indeed, the profile of the field shows a distinct mound of earth (an agger) running the full North South length of it, clearly indicating where the road would have run. There is a slight depression between the Roman road and the earthworks. An 1863 map of Westmorland, clearly shows the earthworks next to the route of the Roman Road, and they are labelled as a Roman Fortress, so it's looking more and more unlikely that these remains represent a motte and bailey castle or medieval ring work.